If you don't mind the potential for blustery winter weather, freezing temperatures and feet of accumulated snow, Buffalo, New York is a great place to visit. The city made the New York Times' list of top places to visit in 2018. Buffalo has bounced back from a declining population and decades of struggling sports teams, not to mention its harsh winters. Part of Buffalo's comeback is tied to how it has repurposed historic buildings and long-forgotten grain silos. Last year, three new brewpubs and two luxury hotels opened up in previously vacant landmark buildings and industrial spaces, the Times reports. Even if the winter temperatures keep you indoors, there's plenty to eat, drink and do to keep you content in Buffalo. Thankfully, there are plenty of regular, relatively-inexpensive flights between Raleigh and Buffalo. We pulled from travel site Skyscanner to provide you with a short list of flights and hotels handpicked with the trendy adventurer in mind. Currently, the cheapest flights between Raleigh and Buffalo are if you leave on December 1 and return from New York on December 5. Frontier Airlines currently has tickets for $145, roundtrip. There are also deals to be had in January. If you fly out of Raleigh on January 24 and return from Buffalo on January 27, American Airlines can get you there and back for $184 roundtrip. Don't miss Buffalo's food scene, with plenty of popular spots to get your fill of local cuisine. Here are a few of the top-rated eateries from Skyscanner's listings. If you're looking for a local favorite, head to Pearl Street Grill & Brewery, which has an average of 4.7 stars out of seven reviews on Skyscanner. "Great beers and really great atmosphere," wrote visitor Laura. "They have live music most nights and the pizzas and wings are really good." Another popular dining destination is Duff's Famous Wings in Orchard Park, with 4.6 stars from five reviews. "Tim Horton's is right around every corner, or so it seems, and easy to grab some coffee and food to go," wrote Richard. To round out your trip, Buffalo offers plenty of popular attractions worth visiting. Here are some top recommendations, based on Skyscanner's descriptions and reviews. Opened in 1905, the Albright-Knox Art Gallery in Buffalo offers you a collection of modern and contemporary art to peruse. Founded in 1890 at the behest of wealthy philanthropist John J. Albright, the gallery partners with the Buffalo Academy of Fine Arts, which itself was founded in 1862. The permanent collection of the gallery includes masterpieces by famed artists such as Vincent Van Gogh, Paul Gauguin and Pablo Picasso. "Most of the collections are from American and European artists and there are constantly changing exhibits with tons of community involvement," wrote visitor Laura. "This grand Rococo theater opened in 1926 and was originally called Shea's Buffalo," wrote visitor Dan. "Even the Mighty Wurlitzer organ is still in action, thanks to the efforts of the Friends of Buffalo Theater." Finally, spend some time at The Buffalo City Hall. The Buffalo City Hall in Buffalo rises 32 stories, making it one of the tallest city government buildings in the United States. 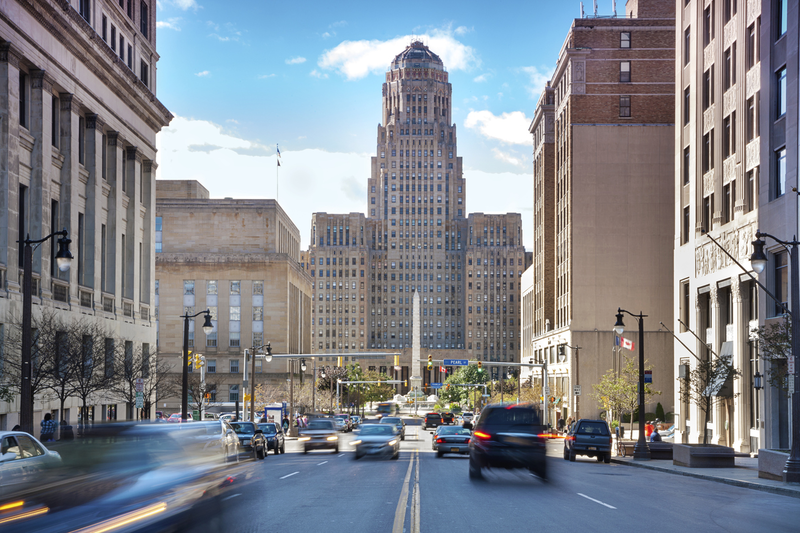 "When you're in Buffalo you've got to include a visit to City Hall," wrote visitor Dave. "It's a bit run down but you can definitely tell how important this city was back when it was built because it is huge."